Day One. The adventure begins Saturday with pick up from Denver International Airport, of course if you would prefer to drive out to the ranch that is fine as well. As the sun sets and our herd of horses run in from the range, you can get settled in to your cabin. Come over to the main house for a bowl of hot stew. Stretch out on in front of the fireplace and let your worries slide off your shoulders, relax. Day two, sleep in and get rested up we have lots of things to do this week! After a hearty breakfast we will head to town to get you fitted for some skis or a snowboard and perhaps visit some local shops or go ice skating before heading back to the ranch. We will try to get you in the bed early so you will be ready for an early start to ski slopes! Day Three. Lets grab a quick bite to eat and get on the road. Our ranch is located between three great ski resorts. We will talk it over with you and find out which resort will be the best fit for your needs or if you like we will plan on visiting each of them! 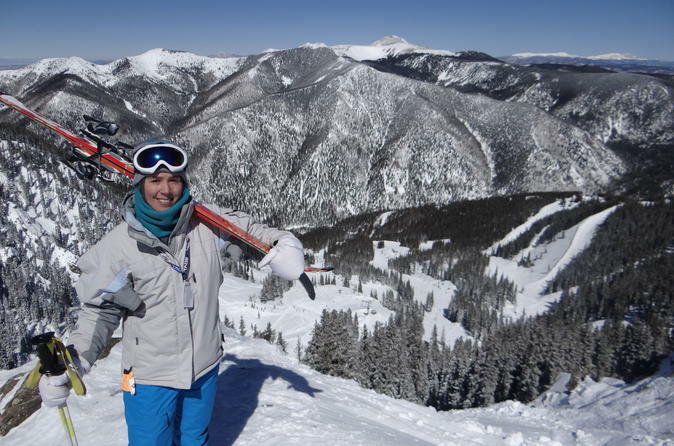 Often we start off at Wolf Creek Ski Resort as they have some famously good snow and several nice easy runs to let you get limbered up. Day Four. Another ski day! After you have skied to your fill are you about ready for a nice hot soak at the world's deepest hot springs? Lets visit the spa and soak those sore muscles. Pagosa Springs Colorado is a cute little town that boasts one of the best spa and resorts in the country. With pools of every temperature you are sure to find the perfect fit. Day Five. How about we give our legs a rest and hang out at the ranch. Lets get out the old cowboy six shooters and see if you have an inner Annie Oakely or Clint Eastwood. Not into shooting? That fine, lets go up in the mountains and see if we can spot some Elk or deer. Or we can drive over to the Old mining town of Creede and visit some shops or the underground mining museum. Day Six. Last day of Skiing lets hit the slopes hard! Perhaps we will try out Taos Ski Valley. After a day on the snow Taos has some really cool shops and galleries to visit. Once we walk around long enough to work up a good appetite lets have Mexican food in the old square before heading home. Day Seven. Since we probably stayed out way too late, sleep in, we will keep the coffee and fresh cinnamon rolls hot till you wake up. How about we get the horses out and go for a ride? Our horses were all raised right on the ranch they are big gentle babies and we have horse for everyone beginner to expert. Since it will probably be chilly we will keep the fireplace going and hot coco on the stove so you can run in and warm up whenever you need to. Day Eight. Sadly the end has come. I suppose we knew it must, it always happens too soon. Hopefully you have made some memories and friendships that will last a lifetime. Today we will drop you off again at the Airport and say au revoir 'til we meet again!